Since we eat gebrokts in our family, recipes with matzah meal, matzah farfel, and cake meal, are not problematic. For those that only eat on the last day, this is a nice treat and easy to make on Yom Tov as it does not require a mixer. Put oven rack in middle position and preheat oven to 350°F. Spread matzo farfel in a large shallow baking pan (1/2 to 1 inch deep) and toast, stirring and shaking pan occasionally, until golden, 15 to 20 minutes. Transfer to a bowl, then cool pan and line with parchment paper. Bring sugar, water, and salt to a boil in a deep 2- to 2 1/2-quart heavy saucepan over moderate heat, stirring slowly until sugar is dissolved. Boil gently, without stirring but washing down any sugar crystals on side of pan with a pastry brush dipped in cold water, until syrup begins to turn golden. Continue to boil, swirling pan occasionally, until syrup is a deep golden caramel. Immediately remove pan from heat and carefully stir in butter with a wooden spoon (mixture will rise up and bubble vigorously). When bubbling begins to subside, immediately stir in toasted matzo farfel and almonds and quickly pour into baking pan, spreading and smoothing with back of spoon before mixture hardens. Transfer baking pan to a rack. If using a foil-lined pan, cool brittle to warm in pan, then peel off foil and transfer brittle to rack to cool completely. If using nonstick liner, cool brittle completely in pan. 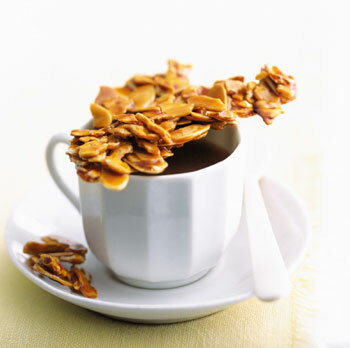 Break brittle with your hands into bite-size pieces, or make into a topping: Break into large pieces with your hands, then put brittle in a heavy-duty sealable plastic bag, seal bag, force out excess air, and lightly pound with a rolling pin into smaller pieces. Brittle keeps in an airtight container in a cool, dry place 1 week.